Apple trees provide a stunning garden addition with their spring flowers and summer fruit. Thanks to modern hybrid techniques, apples can be grown in any climate, from the classic New England regions to the mild wintered Arizona. When you are deciding on an apple tree variety for your orchard, do plenty of research to find the tree that will produce the best fruit for your particular region. Determine your USDA plant hardiness zone to find out what varieties of apples will grow best in your orchard based on your location. Contact your county extension office for a further recommendation of specific varieties that do the best in your area. Also inquire as to whether the recommended varieties are self-pollinating, dwarf or full-sized, and natural or hybrid. 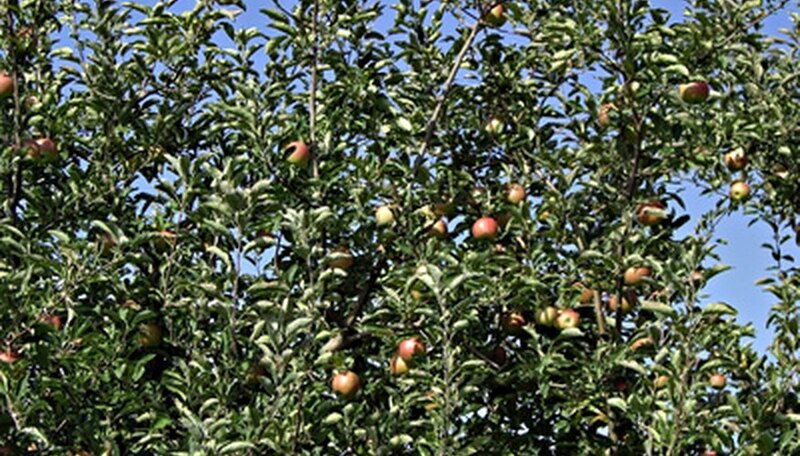 All of these factors determine the amount of trees per orchard and the types required. Design the layout of your orchard. Using a piece of graph paper, sketch out the general design of your land, marking any inclines and declines. Sketch in the apple trees at their proper placements. Dwarf trees must be spaced 12 feet apart for proper growth, semi-dwarfs require 20 feet, and full-sized trees require 30 feet. Also sketch and designate your pollinator trees if you are not using self-pollinating varieties. Contact your county extension office and obtain a soil test kit. Conduct the test and send it into the extension office for review and soil recommendations. Specify that you are planting apple trees, so that the office can give you the best soil nutrient recommendations. Treat the soil with the additions recommended by the county extension office and wait the necessary time for the soil to properly amend all the nutrients. It typically takes one year for soil to prepare itself for planting. Grid out the desired locations for each tree using marking chalk, and verify that the locations are optimal for your area and hardiness zone. Areas to watch out for in cool climates are valleys, where the apple blossoms could freeze in early spring from a draft. Set up your watering system. Follow your tree grid and lay a drip irrigation system so that each intended tree well will be consistently watered. Purchase and plant your orchard. Be patient as your trees grow, keeping in mind that you will not yield a profitable harvest until around your fifth year. What Is the Growth for a Common Apple Tree?